Hello. I made today's card for the April challenge going on over at the Altenew Blog. The challenge is to make a card based on the inspiration photo below. You can check the challenge out here. I coloured the flowers from Magnolias for her stamp set and made my background by smooshing distress ink onto a piece of Bazzill Marshmallow card stock. I fussy cut my flowers out and added them to the water coloured background piece with the sentiment from Altenew Label Love. I added some silver thread, sequins and a piece of silver glitter tape to finish things off. 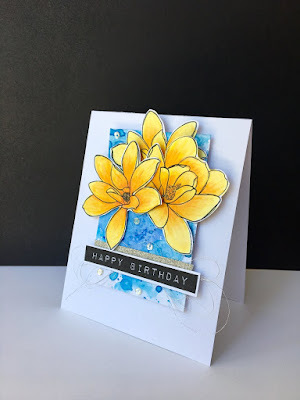 Altenew's Magnolias look amazing in your card, well done!TFS Michelle! How beautiful! Love how bright your flowers are on the watercolour background (I was smooshing myself today lol)! Thank you for taking part in the Altenew April Inspiration Challenge.